I firmly believe the best way to explore a city is on foot.It’s cheap, easy, and gives opportunity to see and experience the city all along the way.As a traveler, you can’t experience these things from behind the windows of a bus or a car. What’s the best way to do all that? Lace up your best walking shoes and explore on your own two feet. Exploring a new city on foot is a great way to get a feel for a new place, discover great restaurants and hidden gems, architecture, culture, road side foods, how the locals behave, and more over you get the opportunity to interact with the locals’ .In this way you will be soaked in the atmosphere of the place to your full enjoyment. 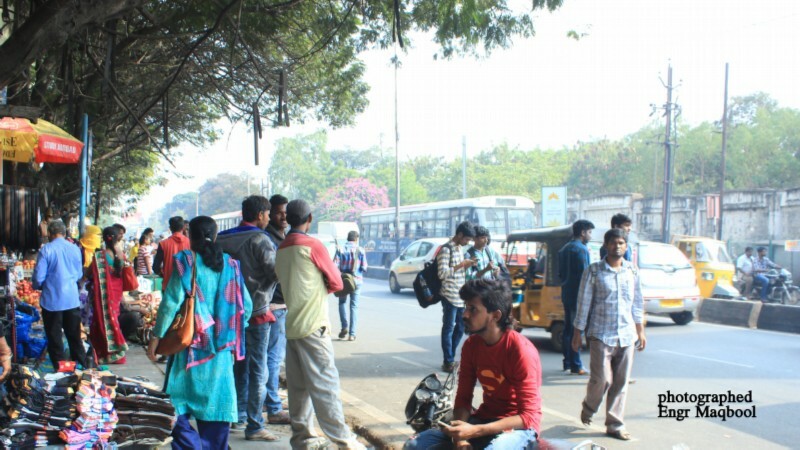 So one fine morning, I decided to explore Hyderabad on foot.This travelling covered from Koti to Moazzam jahi Market.I left city bus (public transport) at Koti stop.It is special to mention that one can get public transport for any part of Hyderabad city from Koti bus stop. So be ready to walk with me from Koti. 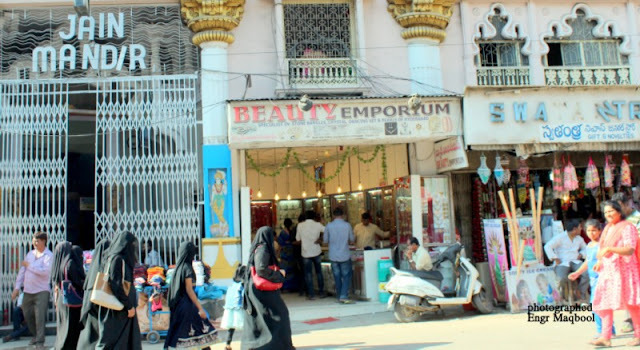 One of the oldest shopping regions in Hyderabad-with an existential pedigree of about 200 years, Koti Sultan Bazaar is the one-stop heaven for the latest trends in women’s fashion, though that’s not the only thing that you’d find here. 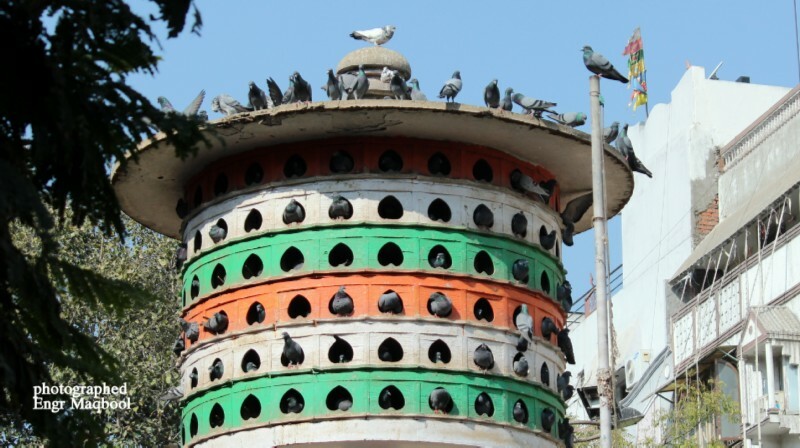 The area's name comes from the word Koti Residency, kothi meaning a mansion. This was later converted (1805) to house the British resident James Achilles Kirkpatrick and which was, in 1949, converted into the campus of the Osmania University College for Women. Here I found many big book shops.Book vendors were selling books lining along the road. Soon realized that since educational institutes surround the area only textbooks are sold here. One point, Koti used to be the go-to place for textbooks, and the weekends would be packed with, medical and engineering students in search for second-hand versions of their expensive reference books. 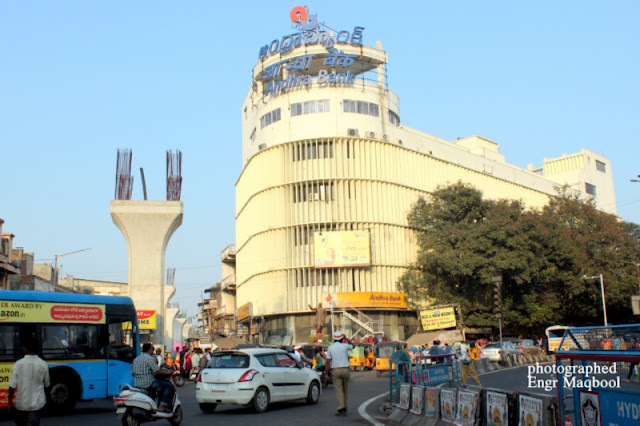 A huge and grand building of Zonal office of Andhara Bank is on a prime location of koti sultan Bazaar. Fruit vendors, most of them are women, sell fresh fruits sitting in a line along road facing Andhra Bank. At a stone’s throw away from the crowded Koti Bus stop there is situated The Osmania University College for Women which is a prestigious educational institution of Hyderabad. The building of Koti Womens College was at once the embassy of the East India Company to the court of the Nizam of Hyderabad, and the residence of James Kirkpatrick, the British Resident. Within its compound there were several quarters, including a zenana (women's quarters) where Khair-un-Nissa lived the love and wife of James Kirkpatrick. Khair un-Nissa was great niece of the Prime Minister of Hyderabad.After independence, this Residency building was converted into a women's college in Osmania University College for Women in 1949. 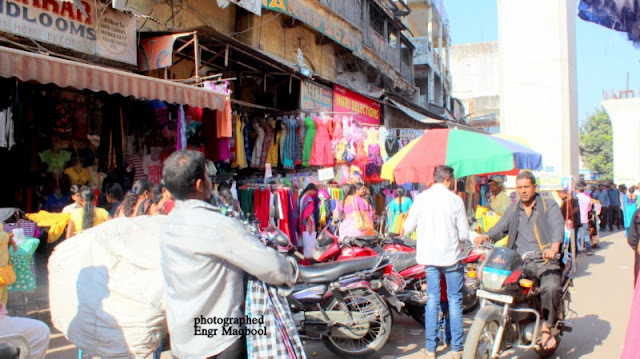 Koti Sultan Bazaar lies between the commercial areas of Abids and Koti. During the British rule in India, Koti Sultan Bazar was called Residency Market. This market has a long 200 years of history. Koti Sultan Bazar is famous for the latest fashion when it comes to women’s clothing. From silver junk jewelry to rare pieces, this market is a one-stop-shop for shopping in Hyderabad for all you ladies out there. From stylish Indian salwar kameez sets to churidars and dazzling footwear. The variety on offer is mind boggling and the amazing deals you can get here will surely confuse you. 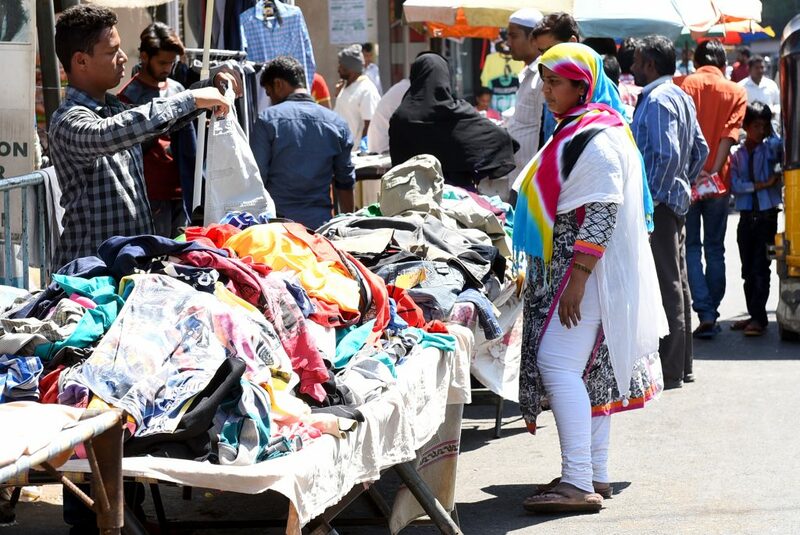 Street shopping in Hyderabad at its best! 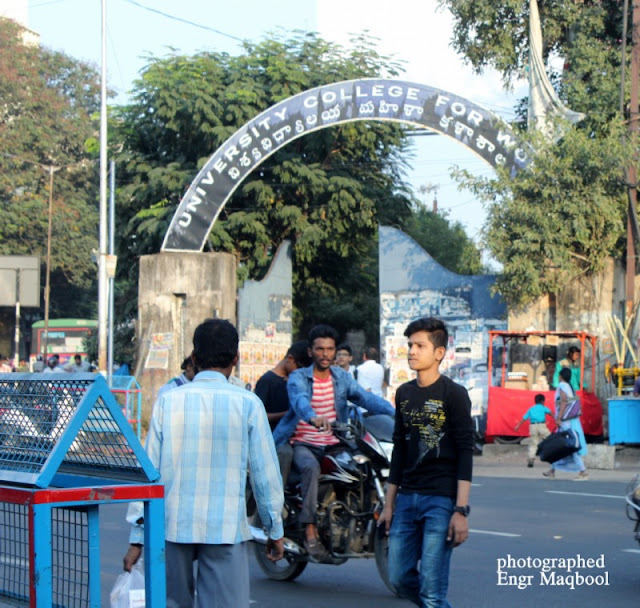 Osmania Medical College is one of the oldest medical colleges in India (1847 A.D.)Seventh and the last Nizam of Hyderabad Nawab Mir Osman Ali Khan established Osmania University in 1919 A.D. and in the following year the Hyderabad Medical College. 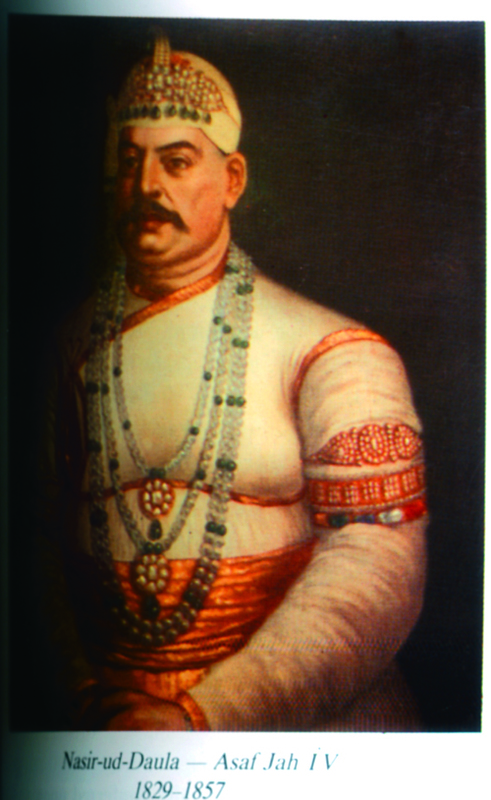 The Fourth Nizam of Hyderabad Nawab Nasirud-Dauwlah fell ill (Probably he was suffering with Diabetes) in 1842/43 A.D. and he did not recover for quite sometime under the treatment of Unani Hakeems, as all the people in Hyderabad had belief in Unani Medicine and no one practiced Allopathic Medicine here before 1846 A.D.
Mr. Fraser the then British Resident in Hyderabad recommended treatment of the ailing Nizam by the Residency surgeon Dr. William Campbell Maclean He treated the Nizam by adjustment in his daily diet, without any medicine, as the Nizam wanted that, he must be cured without having to eat or drink any Allopathic Drug. The King followed the diet schedule as prescribed by Dr. Maclean and recovered within a period of three months. The western system of medicine thus appears to have gone high in his estimate and so, he ordered for the establishment of the medical school in Hyderabad. But, for one year no student came forward. 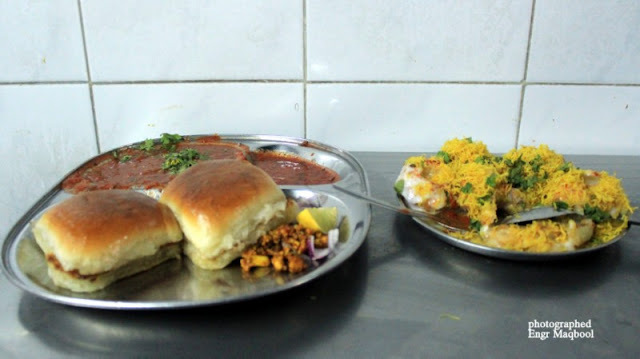 While roaming in Koti, you can’t miss the tempting spicy Rajasthani Chats. 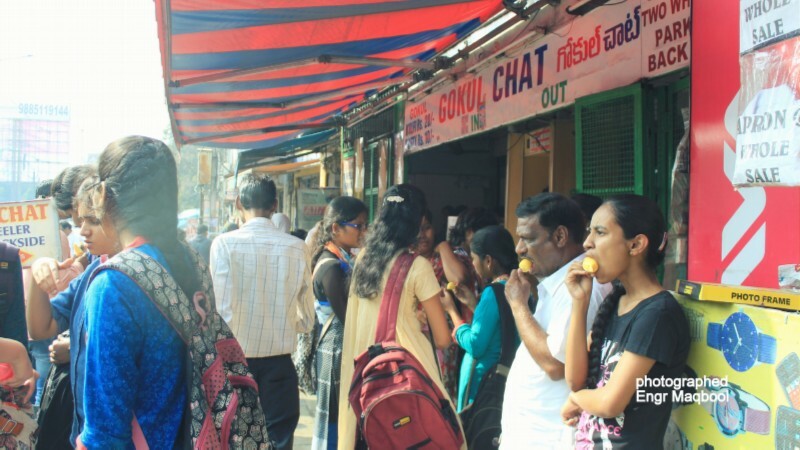 This age-old eatery is the go-to place for the most mouth-watering chaat in the city of Hyderabad. Few years ago, Gokul chat shop faced a terrorist attack and since then entry is allowed after a security check. They have removed the sitting arrangements, eat standing. Here I charged my energy enough to walk on foot by dahi puri, hot mirchi bajji, pav bhaji, and ended with a cooling sweet Kulfi. There is small PIGEON park behind the gokul chat that is a marked place for pigeons and belongs to pigeon welfare association with a colorful pigeon house towering in the middle. 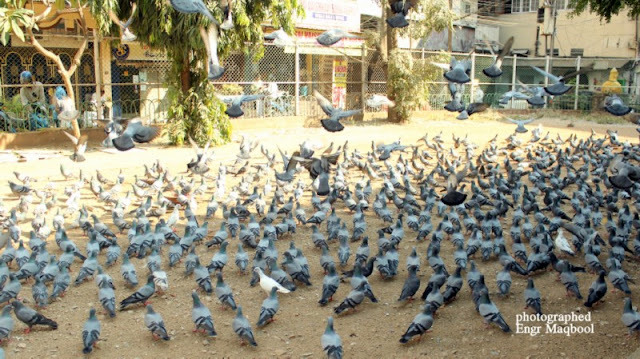 there were thousand of pigeons in this small park.i entered in the park and fed the pigeons and clicked them. this was a beautiful part and experience of this walk. Behind this PIGEON park was another market full of chaos, with vendors all around and customers pushing around. In this street there was a Shvetambar Jain temple, a typical structure in white marble. Hyderabad Metro work was on progress, this construction turned this market over crowded. 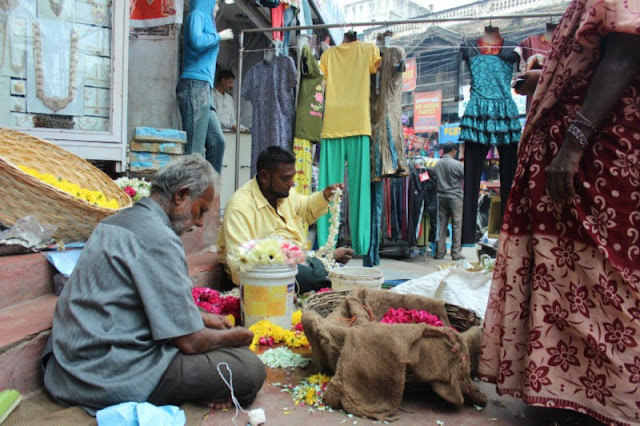 Sometimes it was difficult to breath Fresh air.Flower vendors were selling Flowers on road for devotees of this temple. One of the oldest markets in Hyderabad is ABIDS,which may be called as “Abids, a shopper’s paradise”.Both sides of the Abids road is dotted with hawkers selling a variety of merchandise at a price most find reasonable and light on wallets. What also appeals to shoppers is indulging in the artful haggling over prices that is a common sight all the day.From books to knives, this market has almost anything on sale at a reasonable price. The origin of this Abids street name is quite interesting. Abid was the name of the owner of the first shop, Albert Abid, Valet and Steward, a Jewish merchant in the area. He was also a incharge to Nizam IV. Hence the place is so called. According to another version, Abids derives its name from the first departmental store of Hyderabad, owned by Abid Evans. Such was the popularity of this shop that the whole place comprising business CENTERS got this name. Come Sunday and the roads of Abids spring to life with shoppers searching for literary efforts of popular authors. 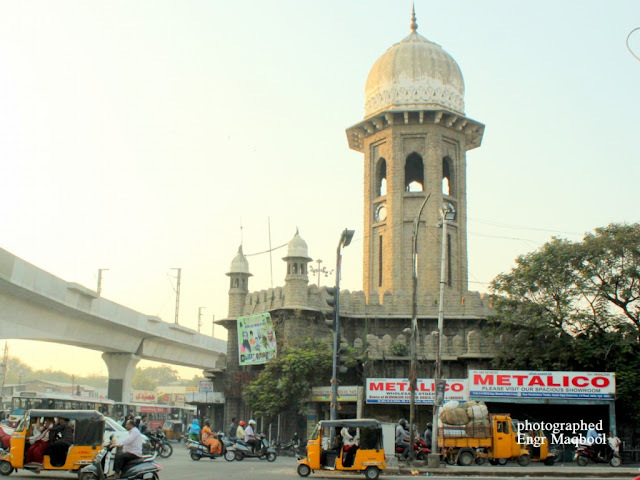 When one talks about book bazaars in Hyderabad, the first name that comes to mind is the Sunday Abids book market. 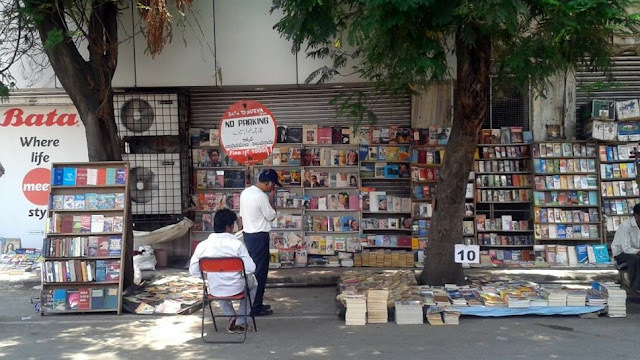 This is a treasure trove for book lovers.Every Sunday morning, the book vendors are lined up on the footpath and staircases. 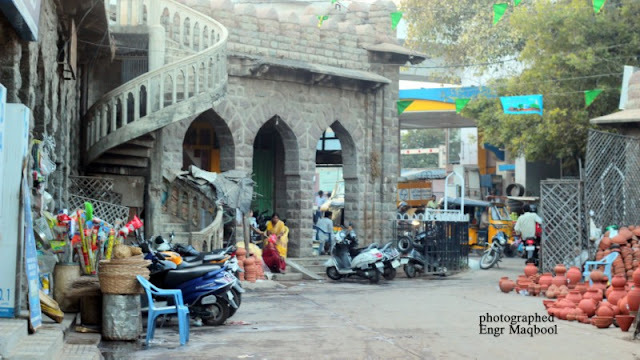 Moazzam Jahi market was constructed by the last Nizam, Mir Osman Ali Khan in 1935, and was named after his second son Moazzam Jah Bahadur. 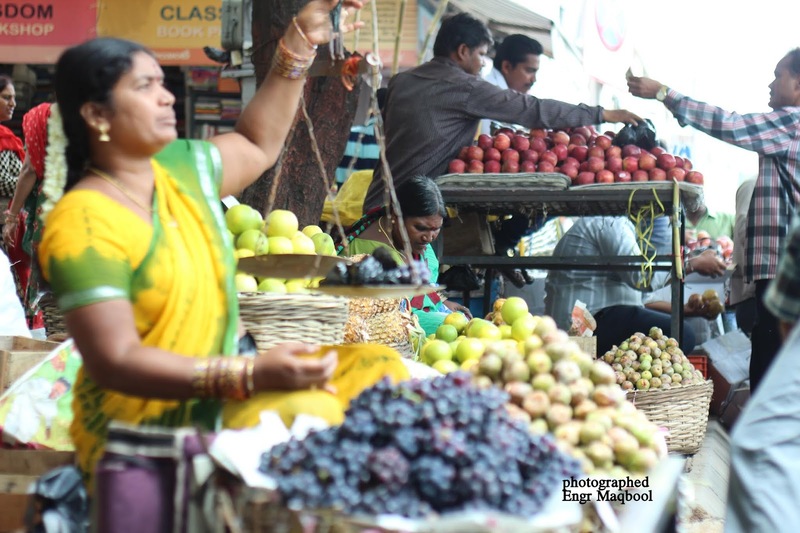 Originally meant to be a fruit market, it soon turned out to be a place where one could find just about anything — fruits, vegetables, flowers, groceries, earthen pots, arms and ammunitions, paan, ice-cream, dry fruits, hookahs and ittar — and buy them at wholesale prices. 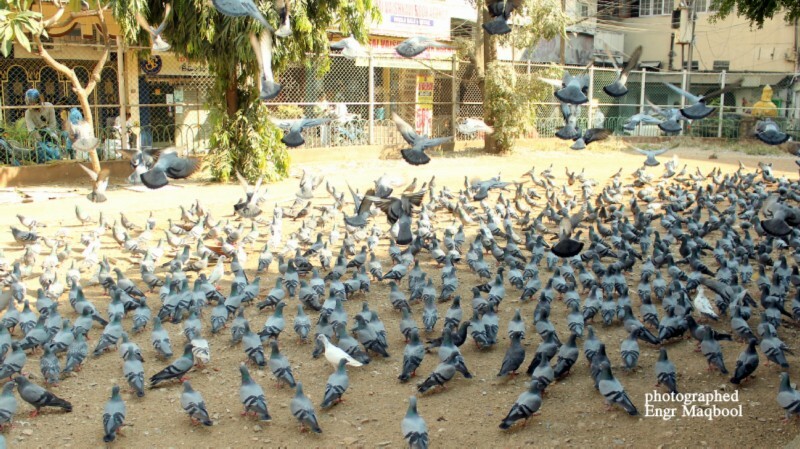 Open space inside the market is feeding ground for pigeons. Moazzam Jahi Market was constructed in a planned way, with covered corridors and open spaces. The material used for construction of this structure is the granite stone, and the roofing is done in the jack arches method. The market has a flat terrace accessed by spiral staircases; its interior courtyard forms an integral part of the building and was designed with the city's climate in mind. 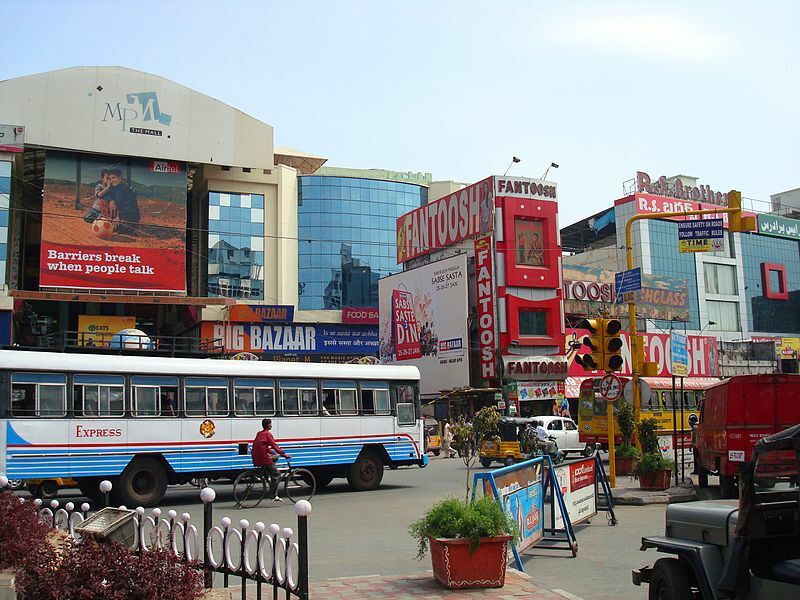 Even today, the market boasts of the busiest streets in the city with hordes of visitors. This Moazzam Jahi Market is a connecting point between the old and the new city. The famous ice-cream Shops in the market are the visitor's delight and serve a variety of handmade ice cream to patrons in all seasons. I would ensure that my friends coming to Hyderabad would also visit the place and taste something that they cannot find anywhere else in the world. The market is noted for ice cream that every one craves for it. 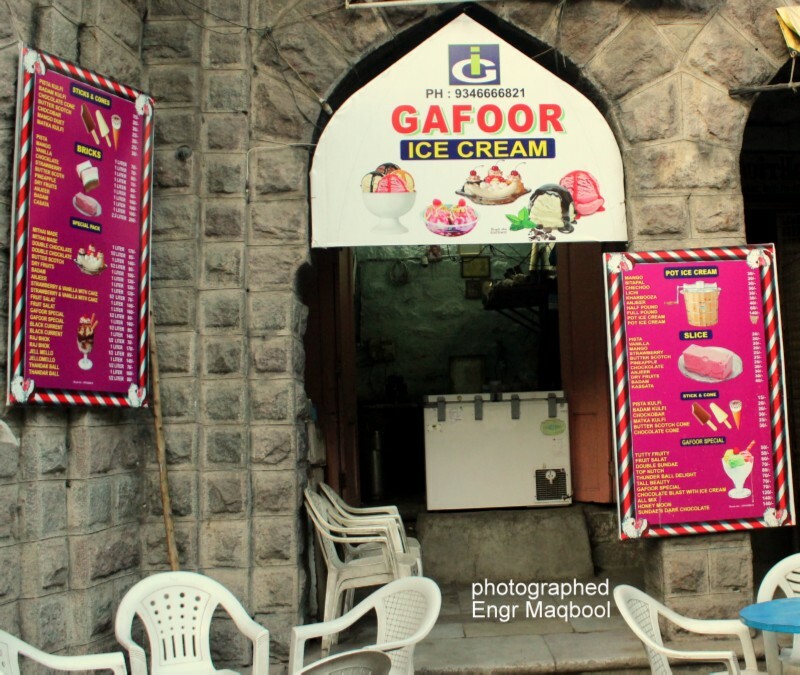 This place is a house for different flavors of mouth watering ice creams such as sitafal, anjeer, mango,Papaya and many more. It was started by Sri Khanchand Ramnani ji, a Sindhi migrant from Karachi to Hyderabad in 1947 during Partition of India. In 1953 Ramnani opened the first Karachi bakery of Hyderabad next to Seena Bakery Moazzam Jahi Market. Today it is the most famous bakery of not only Hyderabad but the whole region, located on Moazzam Jahi Market. Karachi Baker is popular for its fruit biscuits, dil kush ,fruit bisciuts and plum cake. Experience the aroma this bakery dispenses as you walk across it. I was ecstatic in reurning back with enamored experiences of this small foot walk on road of Hyderabad , from Koti and ended at heritage Moazzam Jahi Market.Where I ending my sweet carving by mouth melting handmade ice cream bowl of Ghafoor Bhais icecream parlour and purchasing a pack of fruit biscuits from Karachi Bakery.